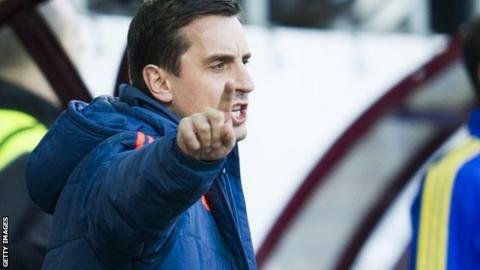 Gary Neville drew his first La Liga game in charge of Valencia as they came from behind with 10 men at Eibar. The hosts led before half-time when Sergi Enrich scored from close range. Valencia had Lucas Orban harshly sent off in the 63rd minute for an aerial challenge on Dani Garcia, with Jaume Domenech saving the penalty. Despite not managing a shot on target, Valencia equalised late on through David Junca's own goal, before Eibar's Ivan Ramis was dismissed. Valencia remain ninth in the table, above their opponents on goal difference. Neville, the former Manchester United defender and current England coach who replaced Nuno Espirito Santo this month, lost his first game 2-0 to Lyon in the Champions League on Wednesday. He looked angry throughout a poor first-half performance against Eibar, and was warned by the referee for his behaviour on the touchline. Valencia's passing repeatedly let them down and a long-range shot from Andre Gomes that flew over the crossbar was their only attempt before they fell behind. Ander Capa burst down the right flank with little resistance and crossed for Enrich, who bundled home. Domenech saved brilliantly to keep out Berjon Perez's penalty after Orban fouled Garcia. Valencia equalised when a smart turn and pass by former Manchester City striker Alvaro Negredo, a 76th-minute substitute, forced Junca to deflect the ball clumsily into his own net. Ramis was shown a red card in stoppage time for bringing down Paco Alcacer as he broke clear, with the striker firing the free-kick inches wide. Match ends, Eibar 1, Valencia CF 1. Second Half ends, Eibar 1, Valencia CF 1. Attempt missed. Paco Alcácer (Valencia CF) right footed shot from outside the box is close, but misses to the left from a direct free kick. Iván Ramis (Eibar) is shown the red card. Paco Alcácer (Valencia CF) wins a free kick in the attacking half. Attempt missed. Álvaro Negredo (Valencia CF) left footed shot from long range on the left is too high. Assisted by Jaume. Pablo Piatti (Valencia CF) wins a free kick in the defensive half. Substitution, Eibar. Izet Hajrovic replaces Keko. Corner, Eibar. Conceded by Álvaro Negredo. Corner, Eibar. Conceded by José Gayá. Attempt missed. Takashi Inui (Eibar) right footed shot from outside the box misses to the right. Assisted by Sergi Enrich with a headed pass. Foul by Pablo Piatti (Valencia CF). Keko (Eibar) wins a free kick in the defensive half. Own Goal by David Juncà, Eibar. Eibar 1, Valencia CF 1. Substitution, Eibar. Takashi Inui replaces Saúl Berjón. Javi Fuego (Valencia CF) is shown the yellow card. Pablo Piatti (Valencia CF) wins a free kick on the left wing. Substitution, Eibar. Adrián replaces Borja Bastón. Substitution, Valencia CF. Álvaro Negredo replaces Antonio Barragán. Attempt saved. Ander Capa (Eibar) right footed shot from outside the box is saved in the top left corner. Assisted by Saúl Berjón. André Gomes (Valencia CF) wins a free kick in the attacking half. Javi Fuego (Valencia CF) wins a free kick in the defensive half. Attempt missed. Sergi Enrich (Eibar) right footed shot from outside the box misses to the right. David Juncà (Eibar) is shown the yellow card for hand ball. Hand ball by David Juncà (Eibar). Ander Capa (Eibar) is shown the yellow card for a bad foul. Substitution, Valencia CF. José Gayá replaces Danilo.